A large proportion of the pattern electroretinogram (PERG), which is recorded from the surface of the cornea or the infraorbital skin in response to a similar grating or checkerboard stimulus as is used to evoke the cortical VEP, is believed to be due to the activity of retinal ganglion cells. When recorded at a fast rate, the PERG is usually found to be attenuated in patients with a past history of optic neuritis (e.g., Plant et al., 1986; Bradshaw, 1992), although not significantly in every individual. When recorded to "transient" stimuli presented at a relatively low rate, it is found to be the final negative component (N95), rather than the preceding positivity (P50), which is most affected (Holder, 1991) (Fig. 3). In the acute phase of optic neuritis the P50 may also be temporarily attenuated, recovering in parallel with the recovery in visual acuity (Berninger and Heider, 1990). The P50 component can also be chronically attenuated in patients with long-standing optic nerve lesions or after optic nerve section, presumably as a result of retrograde degeneration of the ganglion cell layer, but the mechanism of its brief attenuation during acute optic neuritis is unclear. A 28% incidence of retinal vascular abnormalities (retinal venous sheathing and/or evidence of inflammation) was noted in a group of patients in the early stages of optic neuritis (Lightman et al., 1987), but it was not determined whether this was associated with PERG changes. Among patients with clinically definite MS, similar ocular inflammatory changes were seen in 18% (Graham et al., 1989), suggesting that vascular lesions in the retina may occur independently of optic neuritis. These usually appear to be asymptomatic, but it is possible they may contribute to elec-trophysiological abnormalities such as delayed VEPs to repetitive stimulation (Mitchell et al., 1983). 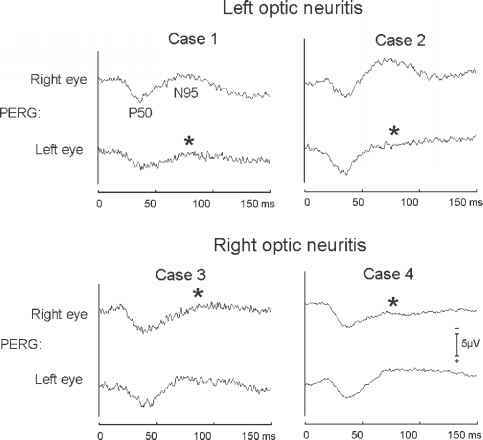 Figure 3 Abnormal pattern ERGs in four patients with a past history of optic neuritis. In every case the N95 peak recorded from the cornea of the affected eye is relatively attenuated (asterisks). In Case 1 the P50 also appears relatively attenuated and broadened. suggesting that the degree of retinal ganglion cell degeneration was related to the extent of axonal loss. This group of patients was tested at least 12 months after the optic neuritis episode, so there had been ample time for retrograde degeneration to occur subsequent to demyelination and (presumably) axonal transection. It was reported by Falsini et al. (1992) that the PERGs were also significantly affected in the eyes of patients with MS but no history of optic neuritis, this time in terms of phase (latency) but not of amplitude. However, they did not report how many of these patients also had delayed cortical VEPs, which might indicate that the PERG changes were due to subclinical optic nerve demyelination rather than a primary retinal lesion. Among a group of patients with MS who did have a past history of optic neuritis, Porciatti and Sartucci (1996) found that PERGs to color-contrast gratings reversed at a fast rate were significantly attenuated in the affected, but not the fellow, eyes. When presented at a slower rate, the responses of the fellow eyes were also smaller on average than those of normal controls, although it was not stated whether the difference was statistically significant. The cortical VEPs were also apparently abnormal to stimulation of the fellow eyes, so the PERG changes might represent a similar process of retrograde ganglion cell degeneration, secondary to subclinical, insidious demyelination. In a later study (Falsini et al., 1999), significant PERG amplitude attenuation was noted in response to sinusoidally modulated, monochromatic gratings reversing at a fast rate in the eyes of patients with MS but without any history of optic neuritis. Although the most marked effects tended to be associated with delayed cortical potentials and measurable psychophysical defects, suggesting subclinical demyeli-nation and axonal loss, the PERGs were also significantly attenuated (albeit only at relatively high spatial frequencies) in eyes for which all other investigations, including VEPs, were normal. This appears to be the most suggestive elec-trophysiological evidence for changes in the properties of retinal ganglion cells that apparently cannot be explained as a secondary consequence of optic nerve demyelination. Also consistent with a change in the firing properties of retinal ganglion cells, there is evidence for expression of an abnormal ensemble of sodium channels within these retinal neurons in experimental autoimmune encephalomyelitis, a model of MS, and this would be expected to alter the firing pattern of these cells (see Chapter 7). From the 1960s to the 1980s, there was a small but not inconsiderable literature (reviewed by Halliday, 1993) suggesting that the flash electroretinogram, generated in more peripheral retinal layers as compared with the PERG, may also be affected in some patients with MS. Papakostopoulos et al. (1989) reported a significant amplitude reduction of the b wave recorded under photopic conditions in two groups of patients, one with clinically isolated optic neuritis of recent onset and the other with a past history of optic neuritis in the context of MS. Since it is generally agreed that the b wave has a preganglionic origin, this might suggest a process of retrograde, trans-synaptic degeneration occurring relatively early during the episode of optic neuritis. No evidence was found for involvement of the asymptomatic fellow eyes; hence there was no suggestion of a primary retinal defect occurring independently of optic neuritis. Cortical somatosensory evoked potentials (SEPs) to stimulation of major nerve trunks in the arm or the leg are abnormal in a large proportion of patients with established MS (reviewed by Jones, 1993b). During periods of acute sensory relapse, the distribution of SEP abnormalities tends to coincide quite closely with that of the clinical sensory deficit. Most SEP abnormalities are therefore presumed to be due to discrete lesions of sensory pathways of the spinal cord and the brain, although there has been only one pub lished case study demonstrating an apparent relationship between abnormal SEPs and a cervical cord lesion seen at autopsy (Matthews and Esiri, 1979). Lower limb SEPs tend to be more often affected than upper, which may be a simple consequence of the greater length of the pathway and the consequently greater likelihood that a plaque will be situated in an appropriate location. The first cortically generated potentials, N20 to median nerve stimulation and P40 to stimulation of the posterior tibial nerve, may sometimes be delayed by 10 ms or more. This suggests a similar slow conduction velocity through the plaque as was suggested for the optic nerve lesions causing VEP delays. An earlier subcortical component of the median nerve SEP (N13), recorded from the dorsum of the neck with reference to an electrode on the scalp, is not usually straightforwardly delayed but may be attenuated, fragmented, or even apparently absent (Fig. 4). This occurs mainly because more than one structure between the dorsal root entry zone and the cuneate nucleus contributes to the N13, partially through far-field activity picked up at the reference site. Also, the absence of any recordable activity is probably attributable to temporal dispersion and phase cancellation. With the reference electrode at an electrically indifferent site away from the head, it is sometimes possible to recognize a response pattern in which that part of the N13 generated more rostrally, at or above the foramen magnum (sometimes termed N14), is delayed, whereas the "true" N13, which arises in the dorsal horns at low cervical level, is apparently unaffected. Such a pattern would seem to be entirely consistent with conduction delay caused by a demyelinating lesion affecting the cuneate tract of the spinal cord at cervical level. use of a local reference electrode on the anterior side of the neck, this can sometimes be shown to be due to selective involvement of the "true" N13, generated in internuncial neurons of the dorsal horn close to the root entry zone at low cervical level. This pattern is more frequently seen in association with herniation of the cord resulting from syringomyelia (Restuccia and Mauguiere, 1991). That the cervical potential is attenuated rather than delayed suggests damage to neurons within the dorsal horn rather than demyelination of presynaptic axons, although more likely as a result of extraneuronal inflammation than intrinsic neurodegeneration. The peripheral N9 potential recorded from the region of the clavicle or Erb's point to stimulation of the median nerve is generally, perhaps even universally, found to be normal in patients with MS, with or without sensory impairment in the appropriate limb. In a group comparison of 75 patients with MS and normal controls, we discovered no significant delay or attenuation of the N9 (Jones, unpublished). The greater part of the N9, probably at least 90%, is due to stimulation of peripheral sensory fibers whose cell bodies reside in the dorsal root ganglia. A much smaller proportion of the N9 is likely to be due to antidromic activation of motor fibers, with their cell bodies in the ventral horns. Although it is conceivable that plaques involving the ventral horns might lead to degeneration of some peripheral motor axons contributing to the N9, given the wide normal variability of its amplitude and the preponderance of sensory fascicles in the median nerve, it is not surprising that no such effect has been detected. When lesions in the cervical region cause delay of the cortical N20, it is presumably the central axons of the primary sensory neurons that are demyelinated. The absence of any evidence for electrophysiological changes in the N9, generated in the peripheral branch of the same neurons, implies no primary degenerative process involving the sensory neuron itself. There must also be little or no retrograde degeneration of the dorsal root ganglia resulting from demyelination and/or transection of the central axons in the dorsal columns. In a study where SEPs were recorded in conjunction with MRI of the cervical cord in MS patients with sensorimotor symptoms in the upper limbs (Turano et al., 1991), an association was noted between SEP abnormalities and MRI defects in the dorsal rather than the ventral, and the ipsilat-eral rather than the contralateral quadrants of the cord. This confirms that SEPs depend on the dorsal sensory tracts of the cord that project ipsilaterally as far as the dorsal column nuclei of the brainstem. In accordance with this model, when MS patients exhibit a dissociated sensory deficit, abnormal SEPs tend to be recorded from limbs with sensory impairment of the "dorsal column" type (joint-position and/or vibration sense) rather than the "spinothalamic" modalities of temperature and pain (as first described by Halliday and Wakefield, 1963). In our own experience, most patients with abnormal SEPs complain of some degree of numbness in the affected limb(s), which is probably a reflection of diminished light touch sensitivity rather than insensitivity to pain. Positive sensory symptoms such as paresthesias and Lhermitte's phenomenon tend not to be associated with abnormal SEPs. As in the visual system, one would not expect to find overt sensory deficits resulting from lesions that cause only delayed conduction without interruption of axonal continuity. It is probably the case, therefore, that the sensory impairment usually associated with abnormal SEPs ("clinically silent" SEP abnormalities being relatively rare) reflects a degree of conduction block, axonal transection, or neuronal degeneration. 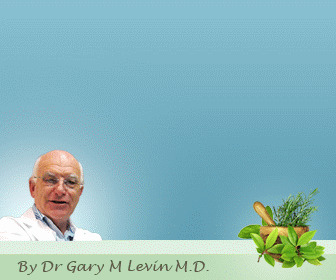 Regarding the electrophysiological evidence, there would seem to be no way of deciding between a primary degenerative process and a secondary effect of inflammation and demyelination, but the tendency of cord lesions not to respect the anatomical boundaries between fiber tracts and white vs. gray matter argues in favor of the latter.